I’ve been a crafty chick for as long as I can remember, and when I was a kid, I had one of those kid’s DIY kits for hemp bracelets. I made SO MANY bracelets… I loved it. But that was years ago, and I was definitely out of practice. Now that paracord bracelets are on trend though, I was inspired to revisit my ol’ bracelet making days with a little updated twist: neon cord in place of hemp! In the above photo, the pink cord is your base cord. Choose whatever color you’d like for your base cord, wrap it around your wrist 4 times, and cut. Carefully melt the ends with your lighter to prevent it from unraveling. I doubled my side cords for increased thickness, but this is completely optional, as is using two colors. Fold your cord in half. If using one color for both sides, measure your cord from hand to hand (the length of your arm span) twice, and cut. Melt the ends with your lighter. 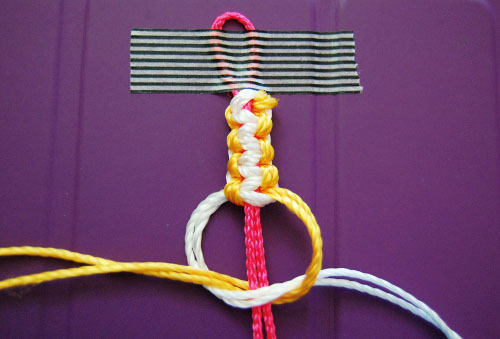 If you are using one color, but want to double it, simply cut a second cord the same length. Fold your cord(s) in half. If using different colors for each side (to achieve the look of the pink & white and orange & white bracelets above), measure a length of each color from hand to hand (the length of your arm span), and cut. Melt the ends with your lighter. Fold your first cord in half and slide one end of your second cord through the loop of the first cord. Pull the second cord through so that the two ends of the second cord meet, linking the two cords together at their middles. Place your base cord over the midpoint of your side cords (the fold if using one color OR the point where your colors are linked if using two colors). You want your side cords down just far enough so that they create a loop the size of your wooden bead at the top of the base cord. If it helps, tape the loop to a book or table with washi tape, or pin the loop to your jeans with your safety pin. Place your left cord over your base cords, leaving a loop on the left side. Place your right cord over the length of the left cord that is now on the right side, slide your right cord under your base cords, under the loop created by the left cord on the left side, and through the loop. Place your right cord over your base cords, leaving a loop on the right side. Place your left cord over the length of the right cord that is now on the left side, slide your left cord under your base cords, under the loop created by the right cord on the right side, and through the loop. Repeat steps 2 – 8 until your bracelet fits your wrist. When your bracelet is your desired length, slide your wooden bead onto the base cords (if not all the cords), and tie a knot using all the cords. Using your lighter, carefully melt the cord ends and parts of the knot to keep it secure. To wear, slide your knot and bead through the loop! I have three different styles pictured here. 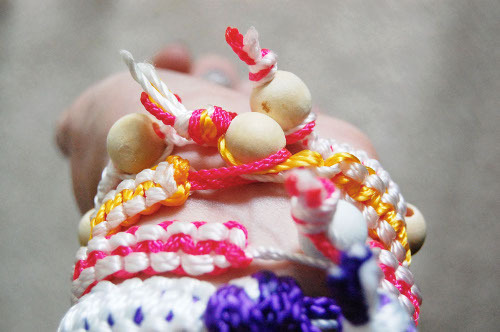 The orange and pink bracelets are done with different colored side cords, the larger white bracelet is done using two long strands of white cord over a thicker purple cord for the base (finished with a knot and no bead), and the white bracelet with beads uses a single strand of long white cord with beads strung onto the base cord ever 8 knots! Get creative with your designs! 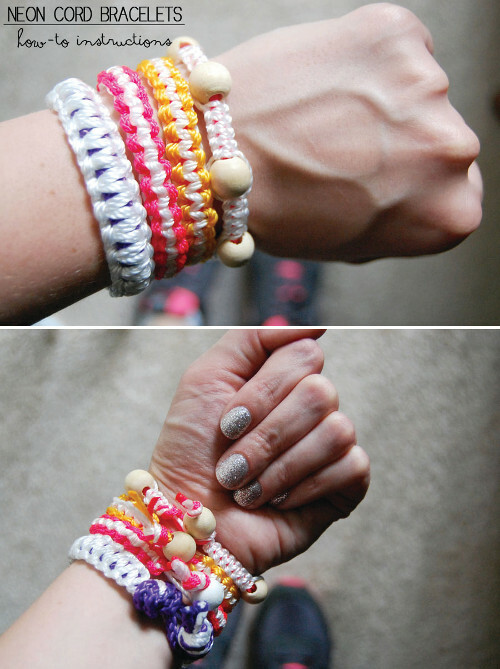 This is a fun and easy craft for kids, too — sort of like friendship bracelets! If you whip some up, I’d love to see what you come up with! This entry was posted in Accessories, Crafts, Jewelry Making, Kid's Crafts, Summer and tagged Camp Crafts, Green Crafting on July 16, 2013 by Monica.